Whatsapp is clearly dominating global instant messenger market at present. It has been pushing in some seriously interesting updates from the past few months, turning it for the first time into a platform for passively consuming content, similar to the way people scroll through their Facebook or Instagram newsfeeds. WhatsApp has announced a new feature that let you express yourself using a short video, this feature is exactly like Snapchat’s hugely successful Stories feature, launched three years ago, which lets users share similarly-ephemeral timelines. 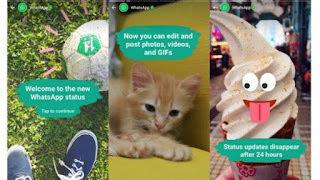 The new feature "WhatsApp Status" will let users share photos, GIFs or videos overlaid with drawings, emojis and a caption that will be visible to selected friends for 24 hours, before disappearing. The feature was tested in November last year and was pushed to beta testers last week. As you would expect, Status gets a tab of its own, in between Chats and Calls. It's easy to create Status messages, especially if you've used the aforementioned Stories feature in either Snapchat or Instagram. WhatsApp Status updates you create are visible to your contacts by default, though you can change them to My contacts except... or Only share with... as well. Within the Status tab you will see various groups: My status, which shows your most recent WhatsApp status (you can swipe to see who's seen your Status, similar to messages); Recent Updates, which shows new WhatsApp Status messages that your friends have created in the last 24 hours; Viewed Updates, which is self-explanatory; and Muted, which lists updates from users you've muted. If you deleted a WhatsApp Status you've created, it's deleted from the phones of all your contacts - even from ones who've already seen the Status. 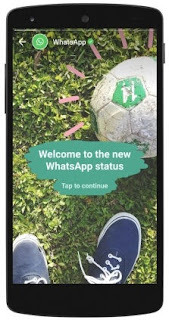 The new WhatsApp Status feature is rolling out to users in Netherlands and France, the feature will available soon around the world for iOS, Android and Windows Phone users.